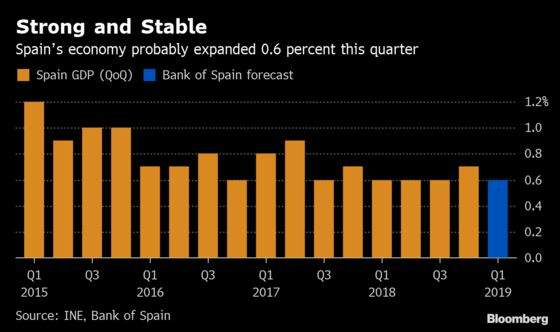 (Bloomberg) -- The Spanish central bank boosted its growth forecast slightly to 0.6 percent in the first quarter, the latest sign the country’s expansion is defying a broader European slowdown. The Bank of Spain maintained its annual growth forecasts of 2.2 percent in 2019 and 1.9 percent in 2020, unchanged from the institution’s previous forecasts in December. That is well above Brussels’ projections for the euro area as a whole. Spain hasn’t been immune to the headwinds battering the rest of the euro zone and the robust growth rate forecast for 2019 is still a slowdown from the 2.5 percent rate of expansion in 2018. "The risks for the Spanish economy are clearly to the downside," Bank of Spain research head Oscar Arce told journalists at a briefing in Madrid on Wednesday. In the euro zone more broadly, the Bank of Spain noted a discussion among economic institutions about whether the weakness in trade and the broader external environment will be more persistent than expected. Arce said the Bank of Spain had been expecting first-quarter growth of 0.5 percent but raised its guidance upward to 0.6 percent in the report. Arce said the economic outlook forecast by the European Central Bank and national EU central banks that the euro-area deceleration in large part “is a result of temporary factors that in the second half of the year are going to improve" could ultimately prove too optimistic. “There’s a risk that we could err again in the sense that the euro zone could perform worse than we are estimating,” Arce added. In a quarterly economic update published on Wednesday, the Bank of Spain slashed the contribution of Spanish exports to overall GDP growth by 0.9 percentage point during the three years through 2021. The euro zone is Spain’s main trading partner and trade troubles that have hit growth elsewhere in the bloc are expected to continue to decrease demand for Spanish exports. There are already some signs that the negative trade outlook is starting to hit investments across the euro zone, the Bank of Spain noted. Risks include the absence of clarity on the U.K.’s exit from the EU and "uncertainty over the possible adoption of fresh protectionist measures" at the global level, the Spanish central bank said. Still, Spain’s economy has performed better than the central bank expected just three months ago, which has countered the drag on economic growth caused by external factors such as trade troubles. Strong momentum from the fourth quarter of 2018, when Spain’s economy expanded by a better-than-expected 0.7 percent versus the previous quarter, has carried over into the first several months of 2019. Spanish consumers, the motor of Spain’s economy, have continued to bolster spending, buoyed by a steady increase in employment. The Bank of Spain expects the country’s unemployment rate to fall to around 12 percent by the end of 2021 from 14.4 percent in 2018. Other domestic tailwinds include a drop in the price of oil that has cushioned spenders’ wallets and the ECB’s expansive monetary policy. Spaniards’ savings rate has fallen, a sign they are prioritizing spending over saving. Despite more Spaniards in the workforce, which has helped to boost salaries, the Bank of Spain downgraded its inflation forecasts. Researchers said that an increase in unit labor costs isn’t translating into the upward pressure on prices that they had expected in December. Companies appear to be absorbing the increase in labor costs by shrinking profit margins in Spain, a surprising trend that central bankers are also observing across the euro zone, Arce noted. The Bank of Spain cut its forecasts for harmonized consumer prices by 0.4 percentage point to 1.2 percent in 2019. It projects inflation of 1.5 percent and 1.6 percent in 2020 and 2021, respectively. The Bank of Spain expects the country’s budget deficit to be 2.5 percent in 2019.